Excuse me, but would you mind throwing this?? No matter where you throw it; she will find it. 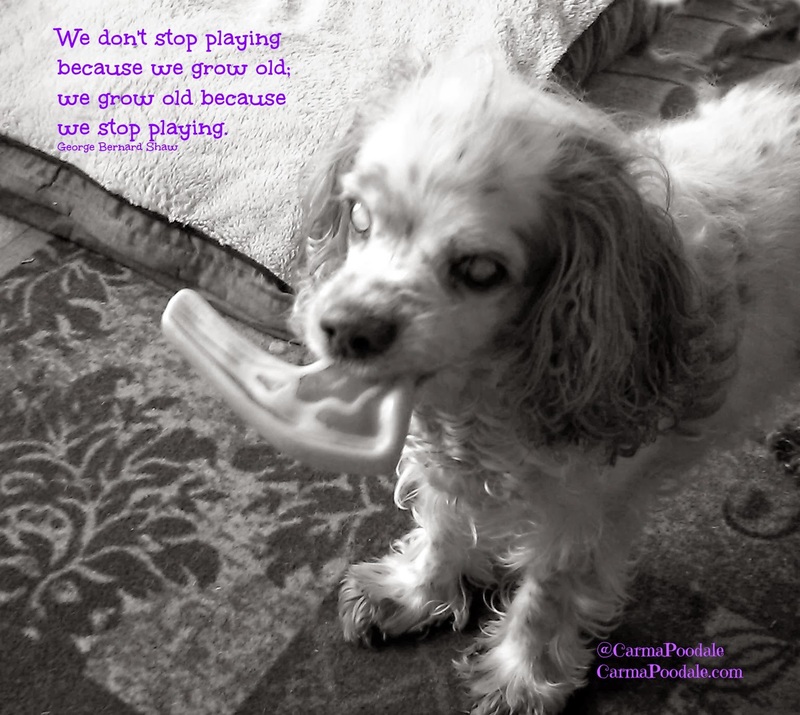 Love to see the seniors that are playful - and blind? Never stopped our TIno either. She would play 24/7 if the pawents would continue to throw the toy. Hope you had a peaceful day! That's pawsome! Go Jenny Sue! We think she is the bomb! Always has been playful even when she was losing her sight. Woohoo! Go Jenny Sue, go! I stopped in and said hi. Thank you for coming by and visiting my blog! You go, Jenny Sue! woo woo woo! She loves her nightly game of fetch , thats for sure. Awww, what a sweetheart! The sentiment you added is perfect and tugs at my heart. Have a great Sunday. Thank you so much for stopping by! Have a pawsome day. I know how much you and others hate them , lately the captcha has been so jumbled that I am having a hard time reading them. Using your nose is the best way to fetch anyways, Jenny Sue! Sometimes you don't learn these things into you are mature, right? She also uses her ears to hear which tone comes from the porkchop. If its a loud thunk she knows its in the hallway on the hardwood floor, softer thunk is carpet and a medium thunk is the kitchen. She loves to play fetch, swim, and play tug a war. Jenny Sue, love your spirit! What's a little handicap like blindness when there's a toy to find. She still has a doggy nose! You go, girl! She used her nose and her ears. She can hear the different tones of where the pork chops falls. She could play fetch all day. Happy Black n White Sunday to you, my friend! Keep healing and soon you will be able to have a tennis ball again. Have you tried the Whistler ball? It makes a whistling sound when you throw it. It's Mr. N's favorite. That's awesome! What a sweet and playful girl. I thought it was pawfect for Jenny Sue. She inspires me everyday. Perfect quote for Jenny Sue to teach us all. That is so cool that she's so playful. Happy B&W Sunday. Aw, bless her. What a cutie, Carma. It is said that when you lose one of your senses, the others take over. Jenny Sue seems to have this down. Way to go, Jenny Sue! What a wonderful example she sets for all of us.